Jerry Bruckheimer's remake of the British flop Eleventh Hour has already had its share of confusion ahead of its October 9th premiere. The network had decided to punt the actual pilot (a remake of the British pilot) for another episode titled "Agro." Now they say they're going back to using the original $4 million dollar pilot as the premiere. The show already tried changing its name, only to change it back. Bottom line: the troubled production can't seem to decide exactly how different it wants to be from the British version.The British version tanked with audiences. And even though the scientific investigation concept is familiar territory, there are some good reasons why Stephen Gallagher's original flop has faced Jerry Bruckheimer and show runners Cyrus Voris and Ethan Rieff with some tough decisions in trying to turn it into an American success. The British series followed a scientist (Patrick Stewart) and his bodyguard (Ashley Jensen) who get called in to investigate abuses of science that have reached the "eleventh hour," or breaking point. After viewing a recent marathon of the British series, I'm impressed with the attention to detail: from the frustrating inanity of good police work, to the loneliness of hunting criminals, there's much to admire about Stephen Gallagher's project. But how much exactly do you steal from a show that wasn't a hit? The American producers are waffling on a few key points. 1.Scary thrills or moral conundrums? Despite dealing with dark subject matter, the British Eleventh Hour went to great pains to intellectualize the fear, with Patrick Stewart yammering about the larger portents for the human race. It appears the producers want to preserve the feel of the original. Ethan Reiff told the press, "It's a science-facts show, not a science-fiction show. It's science that surrounds us every day of our lives." We appreciate a level of detail, but sticking with the slow burn may be one of the reasons the British show never garnered an audience in its brief time on the air. 2.Bad Boys or National Treasure? The jokes about Bruckheimerizing a smart show may or may not be fair, but really, the British original was above all thoughtful and meandering, two words Bruckheimer doesn't know the meaning of. The high price of the pilot may indicate the presence of Bruckheimer's favorite shiny explosions, but at the cost of a more serious approach to the drama that actually strengthened the British edition. 3. An overarching storyline, or a serial? Bruckheimer procedurals like CSI generally eschew a larger ongoing storyline, with a mystery that unfolds over time. The British version never had a chance to stray into this territory, but watching the four episodes that were produced, there were oblique references if you were watching closely. If you were thinking they might bring a larger conspiracy to the American version, think again. After a preview suggested the show was set five years in the future, the producers contradicted their own promo, to saying that they had no idea when exactly the show was set. They followed that up with by explaining why they planned to ignore the rural setting of the original. It wasn't much of an explanation. 4. Hint at romance, or keep the show's leads apart? As much as we loved the paternal relationship between Jensen and Stewart, friend relationships don't captivate audiences. 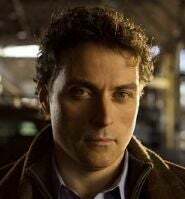 The Rufus Sewell-Marley Shelton partnership has more potential for a Mulder-Scully dynamic, and that certainly was a moneymaker at one time. We will entirely regret saying that the next time that Joshua Jackson makes googly eyes at Anna Torv. hey, um...do you think we're developing romantic chemistry yet? In the end, Bruckheimer will be trying to keep himself interested. As he once put it, "If I made films for the critics, or for someone else, I'd probably be living in some small Hollywood studio apartment." You can view producers Reiff and Voris talking about Eleventh Hour below.